• State-of-the-art tanks and control units are made of corrosion resistant polyethylene that will help keep the work area free of rust and corrosion. • Equipped with a spray nozzle for thorough tank cleaning and disinfecting. • Low profile 50- or 100-gallon tanks allow easy bicarbonate powder loading. • Complete bicarbonate mixing is attained with a powerful 3/4 or 1/2 hp pump system, while the distribution system offers a fractional hp pump for reliable transfer to all points of use. • All models are ETL certified. • Simple installation – shipped ready to use. • Manual or batched controlled systems for convenient treated water filling. 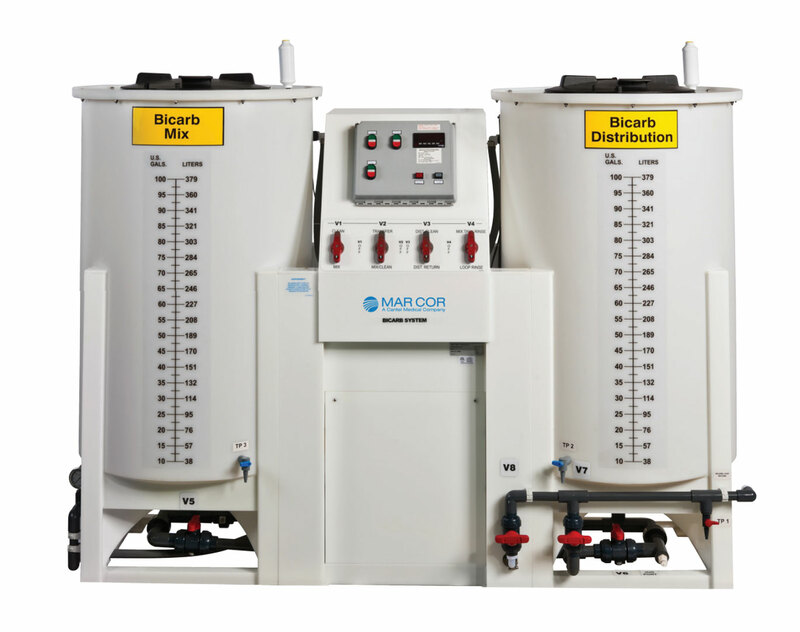 • Mix and Distribution Systems offer a pure water rinse feature of the mix tank and distribution loop that reduces overall cleaning and disinfecting time. • Built-in timer to prevent the possibility of overmixing and to maintain solution integrity. • Tightly sealed lids with air vent filter to help reduce off-gassing and CO2loss. • Sample ports off each tank and loop making testing easy and accessible. Weight (empty) 90 lbs. 125 lbs. 300 lbs. 350 lbs.